Why is it important to establish healthy eating habits in young children? The Children’s Food Trust issued a report in December 2016 based on interviews with parents of four to sixteen year olds revealing how poorly children across the UK eat. The report highlights the high sugar content of children’s diets and how hard it is to lower these levels once children are older. In addition, figures reveal that in 2014/15, 12 per cent of children were obese by age three and 15 per cent were considered to be overweigh in the UK. 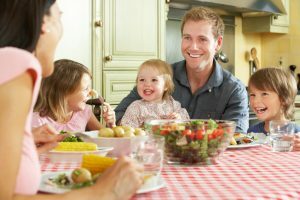 These statistics are not new nor are the messages that accompany them, but they serve to reinforce the message that it is important to establish healthy eating patterns in babies and young children so that by the time their food tastes are fully developed they have established good healthy eating patterns. The statistics also highlight the importance of physical activity for young children in the fight against obesity but for the purposes of this article I will focus on the role of healthy eating. The Institute of Health Visiting advocate exclusively breast feeding babies for the first five months as breastfed babies are better able to regulate their milk intake and so are in control of their eating. Breastmilk has a lower protein content than formula and may protect against raised insulin levels. Breastmilk exposes babies to a wide variety of flavours which will impact their later food preferences. Breast milk may give babies protection from immune- related diseases. It is also suggested that it may protect from some allergic diseases. Once babies are six months old they are able to digest a wider balance of foods and need a balance of foods to meet their nutritional needs. Stores of nutrients such as iron are starting to run low at this stage in a baby’s life and need to be supplemented. Babies will initially be introduced to puree fruit and vegetables as part of the weaning process. The idea is to accustom them to the different textures and tastes of these foods and for them to learn to swallow food of this consistency. It is important to introduced these foods in a relaxed setting, to take your queues from your baby and to make the eating experience pleasurable and relaxed, setting the mood for future positive eating experiences. Over the next six months it is important to introduce your child to a variety of tastes and textures of food adding for example non- wheat cereals and then meat, fish and chicken, dairy food and pulses, pasteurised full fat cheeses, yogurt and fromage frais. The texture should move from smooth puree, to lumpy to chopped over the six months. It is considered a good idea to give your child finger foods such as batons of cooked carrot, broccoli or cauliflower to hold and eat alongside their pureed or lumpy foods, so they can start to feed themselves. Children should be given an opportunity to feed themselves to promote physical development, independence and self -confidence. 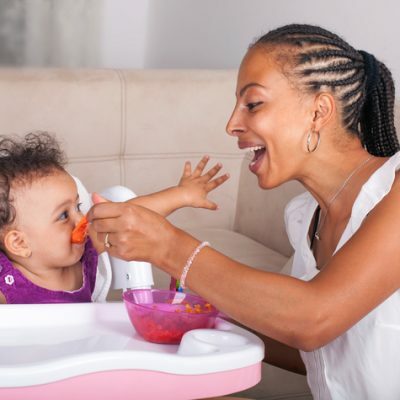 Baby led weaning which encourages children to eat the same food as their family, feeding themselves can commence once babies can sit up unaided and reach for and hold food. Parents sometimes worry that babies will choke. Food must be cut up into manageable sizes and there should always be an adult present who is watching the child. Slowly as their intake of food increases their intake of milk will decrease. Children will become thirsty and water in a beaker offered throughout the day will quench thirst. Avoid fruit juices because of their added sugar content. Once the initial phase of introducing new tastes is in process it will be important to ensure that children are having foods representing the various food groups in order that they remain healthy, have the correct nutrients to help them grow and to promote brain development. Children should have daily portions of proteins, fruit and vegetables, dairy products and starchy foods. By the time they are one year olds they will be having three meals a day and should be eating food that is cut up into small pieces. 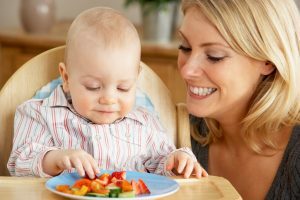 It is a good idea to let your baby join in with family mealtimes whenever possible so that they begin to learn that meal times are sociable times. Provide them with some family foods to taste as they love copying adults at these times, but avoid foods containing added sugar or salt (their kidneys are unable to digest it till they are older) such as stocks and gravy. Relax, enjoy mealtimes with your baby. Be creative, offering a wide range of textured and naturally flavoured foods. Wherever possible if you have the time try to cook your meals from scratch so they contain fresh products.